On July 19th 1936, the Spanish generals rose against the people. The workers of Barcelona, under the leadership of the anarchists. succeeded in smashing the fascist rising within two and a half days. The anarchists did not want to conquer power for themselves, nor did the unions seek to establish a dictatorship. As in all other parts of Spain, an anti-fascist united front was formed. It ranged all the way from the various republican tendencies of the bourgeoisie to the most extreme tendencies of the proletariat - the anarchists. Naturally there was not complete harmony among the various tendencies composing the anti-fascist block, either with respect to aims or choice of means. Some wanted merely to smash the power of the generals and the clergy, but, otherwise maintain a bourgeois capitalist society; others sought a fundamental change in all phases of social life. High finance was on the side of the fascist generals. With the defeat of the generals, they lost their positions of power. The workers' organisations assumed the functions of organising public life. The economic transformations took the form of socialisation. All big enterprises were either collectivised or socialised. The former owners of these big enterprises can offer no more resistance. However, the petty bourgeoisie, even though it did not have the strength to resist the new developments during the first months of proletarian victory, did not accept completely the new order. In the course of this development divergent trends began to appear. The masses of the workers were for the most part organised in the anarcho-syndicalist organisation. the CNT; the petty bourgeoisie, during the months that followed the 19th of July, affiliated itself with the UGT. Not only workers, but traders, owners of small shops, market salesmen, etc., joined the UGT. The developments in Spain took a course totally different from that of other countries. Forms of organisation arose, especially in Catalonia, which had been seen nowhere else. In all other European countries, especially in the democratic ones, the political parties form the currents of public life, but in Catalonia the trade unions have this function. This is due to the syndicalist character of the Spanish labour movement. In the spirit of these traditions, the petty bourgeoisie also organised themselves into trade unions. There is a fundamental difference in the workers' organisation, the CNT, and that of the petty bourgeoisie, the UGT - in whose ranks workers have also been organised - both as to politics and as to their final goal. The UGT accepted collectivisation only under compulsion; they wanted nationalisation, that is, the power of control to lie in the hands of the state and the political parties represented in it rather than in the hands of the workers' organisations. Friction arose, leading to collisions. Among the workers themselves, in the factories and in the management of enterprises, complete understanding and harmony reigned. Only in political questions did opinions differ. When the CNT entered the Catalan government on September 28th 1936, after the dissolution of the Anti-fascist Militia Committee which had been functioning for two and a half months, it took over, officially, the Department of Food Supplies. A central department for food supplies was created under the direction of the syndicalist Juan Domenech. He established an internal trade monopoly for the control of prices. The provisioning of food for the cities was to be taken over entirely by the unions of the transport workers and the various branches of the food industry, who were to substitute - in accordance with a special plan - for the big enterprise and the small traders who had controlled the food industry until then. The small traders became - as members of their unions - equal to the workers of town and country. Or, rather, they were supposed to become such. Continuous conflicts arose between the members of the CNT and those of the UGT, over ways and means of conducting the work. The conflicts created a scarcity of certain food articles. Things became more expensive; sharp political discussions arose as to their cause, and as to the value of the methods. Three months later, December 16th 1936, a new Catalan government had to be organised. This crisis was of a purely political character. The POUM, Workers Party of Marxist Union, was being viciously attacked by the leaders of the UGT, official communists for the most part. They declared the POUM, because of its Trotskyist tendency, a counter-revolutionary party. Soviet Russia herself, through her official representatives, took part in this campaign. The crisis was created in the Generality in order to remove the POUM, whose leader, Andres Nin, was Minister of Justice, from the government. The CNT was opposed to this political manoeuvre but, being in a minority in the coalition government, the POUM was expelled from the government. The dictatorial aims of the communists manifested themselves clearly in the new order. The communists had always been an unimportant minority in Catalonia, as well as in the rest of Spain. By a series of clever manoeuvres their influence increased in Catalonia. They united with the Socialist Party of Catalonia (PSUC), which joined the 3rd International. Although they called themselves socialists, they had the support of the communist organisations, and succeeded in winning the new party over to their line. To the communists of the PSUC the POUM signified a rival party that had to be eliminated from the scene. The Soviet Union strongly supported these manoeuvres. Some shipments of food arrived from the USSR. They also sent some armaments. The propaganda machine started using this support for their political purposes. The POUM began to lose their influence. The influence of the PSUC grew in proportion as that of the POUM declined. The differences between the two parties were extended into the UGT. The members of the POUM belonged to the UGT and even held a number of important positions there. The PSUC wanted to expel them from their posts. A bitter conflict began between the two Marxist brothers for control of the trade unions, a conflict such as is known only too well in many other countries. The political atmosphere among the anti-fascists in Catalonia became ever more unbearable. The CNT acted loyally toward the anti-fascist cause when the new government was formed. It wanted to stop fighting among the political parties. It made the proposal and succeeded in having it accepted, that trade unions, and not the political parties, should be represented in the new government. These trade unions were the CNT and the UGT. The Catalan Left, as a special expression of the Catalan Nation, and as partisans of the presidency, was also allowed to participate. To get the Ministry of Defence, until then in the hands of the Catalan Left, the CNT gave up the Department of Food Supplies to the UGT. Immediately after taking over the Department, Juan Comorera, the new Minister, erased, with one stroke of his pen, the entire work of his predecessor: the inner trade monopoly, the fixed prices for articles of food, was wiped out. Comorera's aim was to break the power of the unions. He therefore wanted to turn over the function of supplying food to private companies. Thus small proprietors, petty traders and tenants were able to make greater profits through higher prices. The scarcity of bread became chronic. Things became more expensive and the masses more discontented. Economically, as well as politically, the fuel had been assembled, and demagogy helped set it alight. On October 22nd 1936, a pact was ratified, by the CNT-FAI on one side and the UGT-PSUC on the other. They agreed to a programme of minimum demands. Both organisations, especially the CNT, made concessions in the struggle against the rebel generals. The workers rejoiced over this pact, and a great mass meeting in the vast bullring of Barcelona, where all of the city workers were assembled, sealed it by acclamation. But there were those who still put their partisan interests above the interests of the proletariat as a whole. A campaign was begun against the CNT and the FAI of the same character as that employed against the POUM. The anarchists and syndicalists were held responsible for everything that did not function too smoothly. Even though the CNT-FAI gave up the idea of collectivisation in those sections where the small tenants were in a majority, and absolutely rejected the proposal for compulsory collectivisation, they continued to campaign against the CNT-FAI among the small tenants and peasants. They appealed to the property instinct, made the idea of collectivisation appear hostile to the lovers of property, and went so far as to denounce the advocates of collectivisation as enemies of the people. Such a malicious campaign had its effect. In January 1937, an insurrection arranged by the politicians broke out against the CNT-FAI in the town of Fatarella. The insurrection, as such, was unimportant; but it was symptomatic. Six months had passed since the victory over the fascists, six months of revolutionary development which led, and had to lead, towards socialisation. But certain parties wanted to reverse the trend of this development. They wanted a national war, not a social revolution. The slogan 'the war and the revolution' for which the CNT-FAI stands, was opposed by the slogan of all the other political parties: 'First, we must win the war. Everything else, a new political order, establishment of social justice, etc., must be left untouched till the end of the war'. The conflicts became more intense. They wanted to manoeuvre the CNT-FAI out of their political positions. Blood flowed in Fatarella. Although both organisations issued a joint declaration regarding the events and their origin, the PSUC press continued its campaign of slander against responsible members of the CNT-FAI, ministers in the Generality, in connection with the outbreak. Certain elements of the Catalan Left and the Catalan Nationalists (Estat Catala) also joined in this insidious campaign. Grave discontent reigned among the workers. The revolutionary workers of Catalonia felt humiliated by the gradual curtailment of their revolutionary conquests after the 19th of July. The representatives of the CNT-FAI vigorously opposed the application of police measures to meet the discontent of the masses. The bourgeois elements, therefore, tried to remove the advocates of the syndicalists and the anarchists from their positions. The workers' Patrols of Control, composed of those fighting elements who had smashed fascism in Catalonia on July 19th, had been functioning as anti-fascist guards, and were legalised as such. The majority of the members of these Patrols are members of the CNT, and when the UGT demanded equal representation with the CNT, to which they were obviously not entitled since they were not equal in membership in the region, bitter conflict sprang up again. The UGT members left the Patrols and devoted their attention to winning over the police to their side. Instead of building bridges of unity, they were widening the gulf that kept the proletariat separated. On Friday March 5th 1937, a few individuals presented an order, signed by Vallejo, director of the arms factories, to the arsenal in Barcelona, to hand over to them ten armoured cars. The director of the arsenal found the document in order and delivered the cars. At the last moment doubts arose as to the authenticity of the order, and the director telephoned to Vallejo for verification. The document proved to be forged, but, in the meantime the armoured cars had been driven away. They were followed and observed to go into the Voroschilov Barracks, belonging to the PSUC, that is, the communists. Premier Tarradellas intervened. At first the barracks' officer denied all knowledge of the deed. Only when threatened with a forced investigation of the barracks did they admit that the armoured cars were there. The purpose of thus stealing and hiding the armoured cars became more than clear to the people of Barcelona during the tragic May days. The solution to this crisis proved to be very difficult. The demands of the PSUC, hiding behind the UGT, became ever more arrogant. When, after a week of negotiations, a new programme for the government of the Generality had been agreed upon, the UGT broke it at the very last moment. Unity, so painfully achieved, was again spoiled. Companys, president of the Catalan Generality, created a provisional government with a peaceful coup d'etat. The syndicalists and anarchists would have been perfectly justified if they had rejected this arbitrary solution. They had proved their good will and patience; they could face public opinion; justice and sympathy were definitely with them. Yet, not to break the anti-fascist front, they swallowed this bitter pill too. On April 16th the crisis was finally solved, the CNT proving very compliant. They renounced their former demands, modified the desires of the proletariat by pointing out the necessities of the war against fascism, and urged them to concentrate their forces for the period after the defeat of the fascists. Comorera no longer headed the Department of Food Supplies, but the office itself remained in the hands of the UGT. The ministers of the CNT had also been changed. The syndicalists and the anarchists had done all they could to maintain the anti-fascist united front. They hoped that a new phase of development would begin now, a period of calm and relaxation behind the lines. False hopes. On April 25th, Roldan Cortada, prominent member of the PSUC was killed near Molins de Llobregat. With this lamentable act as a pretext, the PSUC tried, through their authority over the Public Forces, to take measures of repression against the sympathisers and members of the CNT and the FAI. And although they did not accuse us directly of having committed the attentat, they nevertheless tried, through their actions, to place the moral responsibility for the criminal attentat upon our organisations. Indignation spread over the entire province of Barcelona, both for the deed, and for the harsh measures of the police. The Director of Public Security, Rodriguez Salas, was responsible for these measures. His political career had been a varied one until then. He finally landed with the UGT. His actions against the CNT were considered as provocation's. He had been conducting a struggle against the CNT for several months. A few days later the anarchist mayor of Puigcerda, Antonio Martin, and three of his comrades were shot. The members of the FAl became very indignant over the murder of their comrade, whom they all loved and respected as one of the best. Political tempers rose. The First of May was approaching. The negotiations between the CNT and the UGT for joint demonstrations failed, owing to the manoeuvres of the communists who controlled the UGT. Bitterness turned gradually into hate. Political passions dominated the scene. On May 3rd, Rodriguez Salas launched a new attack against the CNT. Following a preconceived plan and carrying out the orders of the Minister of the Interior, issued behind the backs of the other Councillors, he broke into the Telephone Building with a force of 200 police. This was the last straw. The avalanche finally broke loose. The patience of the workers at last was at an end. They took action against this provocation. The Telephone Building of Barcelona is located in the centre of the city, on Plaza Catalunya. Like all public enterprises, not only in Catalonia but throughout Spain, the telephone building had been taken over by the workers' organisations and controlled by them according to the Decree of Collectivisation of October 24th, 1936. A delegate of the Catalan Generality was at the head of the control committee of the workers. This arrangement was in accord with the laws of the country. It is likely that the UGT was not satisfied with this state of affairs because it had fewer members in the control committee than the CNT. But they also had fewer members among the workers and employees of the telephone building. Rodriguez Salas, not wishing to wait until his partisans might win over a majority of the workers and employees to this organisation, decided to gain absolute control of the Telephone Exchange by force. The workers defended themselves. A machine gun covered the police from an upper storey. They could not go beyond the first floor. While all this was taking place inside the building, word of the assault spread in the square, and soon after, throughout the city. It was as though a match had been set to gunpowder. The workers of Barcelona, belonging to the CNT in an overwhelming majority, feared that this might be only the beginning of still further actions against their rights. People came from all parts of the city to see what had happened; the police tried to keep them back; the collision had taken place. Workers and police ran about excitedly in every section of the city The union headquarters were full of people. Everybody wanted arms. Everybody wanted to be ready to defend other buildings from similar assaults. Perhaps, at some other time, this assault upon the telephone building might not have had such consequences. But the accumulation of political conflicts during the past few months had made the atmosphere tense. It was impossible to stem the indignation of the masses. From the dungeons of dictatorship until today, the CNT and the FAI have always had their defence committees. These committees began to function at once, their members taking up arms. To prevent this incident from leading to even greater collisions, the president of the police, Comrade Eroles, the general secretary of the Patrols, Comrade Asens, and Comrade Diaz, were sent as representatives of the defence committees to the Telephone Building to persuade the intruders to withdraw. the workers refused to work under the threat of the police and it was obvious that calm would not be restored until the police were removed. The effort of our three comrades came to nothing. In the face of the increasing tension among the people of Barcelona, the Regional Committee could keep silent no longer. Its secretary, Comrade Valerio Mas, together with some other comrades, went to Premier Tarradellas and to the Minister of the Interior, Aiguade, and asked them to remove the police in order to pacify the population. Tarradellas as well as Aiguade assured them that they knew nothing about the incident of the Telephone Building. But it was to be proven later that Aiguade had himself given the order for the occupation of the Telephone Building. The Regional Committee of the CNT announced by radio that they would do everything possible to compel the police to withdraw from the building. The workers were asked to maintain their calm and dignity. In the course of the negotiations, the government promised to order the withdrawal of the police. The armed workers also retreated. For the time being everything seemed to be normal again. But soon the news began to spread that Salas' police were disarming the workers, and once again the masses became anxious. The workers were on their guard. They did not trust the apparent peace and remained in watchful positions. In the meantime blood had already been shed. The shooting had begun and two people were wounded. Among the people the nervous tension continued. The workers demanded guarantees. They did not want any repetitions of such incidents. They demanded, through their organisation, the dismissal of the Secretary of Public Security, Salas, and of the Minister of the Interior, Aiguade. If these demands were not fulfilled, they would declare a general strike. Their resignations were not announced. On the following day, a general strike was declared. Had the other parties agreed to the dismissal of these two men, calm would have been restored and the terrible tragedy avoided. Negotiations were carried on till 6 o'clock in the morning - fruitlessly. Toward morning the workers began building barricades in the outer districts of the city. There was no fighting during this first night, but the general tension increased. In some parts of the city shots were being fired. In the district of Sarria some hundred workers armed themselves, built a barricade, and disarmed the civil guards, who consented to such a course. There was no bloodshed there. The workers were masters of the situation. In the district of Sans, where Durruti lived for many years, the workers, especially the Libertarian Youth, assembled in their cultural centres (Ateneos) and built barricades...No fighting...In the district of Hostafranchs the workers built barricades during the night of May 3rd-4th. The civil guards were disarmed by the workers without offering resistance. The large bullring, situated in this district, was also occupied by militiamen on leave from Barcelona. In the Lerida streets, 300 civil guards handed their arms to the workers. No fighting took place in the outer districts of the city, partly because the police were on the side of the workers, and partly because the workers were in such an absolute majority that resistance seemed futile. "It is necessary to come to a speedy solution to this conflict. The incidents now taking place in the street are the result of a long and painful development to sacrifice the organisation of the CNT and its leaders after using their blood and their strength to defeat the treacherous fascists. Don't let them betray you! You know very well, and you have the proof of it, that the CNT-FAI are not against you, either as individuals or collectively. You are, like ourselves, soldiers of the anti-fascist front. Offer your arms to the people and place yourselves on their side as you did on the 19th of July. Neither the CNT nor the FAI want to establish a dictatorship. Nor will they ever tolerate dictatorship so long as a single one of their members is alive. We do not fight against fascism out of love for war; we are fighting to secure public freedom and to prevent the massacre and the exploitation of the people by those, who, without calling themselves fascists, nevertheless want to establish a regime of absolutism, in complete violation of the feelings and the traditions of our people." "The CNT and the FAI address you now to tell you that they do not want to shed the blood of fellow workers in the streets of Barcelona. But we cannot endure the provocation's of those, who, misusing their public offices, want to destroy the rights of the workers of the CNT and the UGT, as was the case yesterday when they tried to occupy the Telephone Building by force of arms." "Men and women of the people! Workers! We speak frankly to the public, which, as always in the past, is proof of our honesty. We are not responsible for what is now taking place. We are not attacking. We are only defending ourselves. We did not start this; we did not provoke it. We are merely answering the abuse, the calumny, and the force that has been directed against the CNT and the FAI, the most implacable anti fascists of all. "We have never concealed our aims; we have given ample proof of our worth. Why do they want to eliminate us? Does it not seem suspicious to you that they are attacking the CNT and the FAI, while in Madrid, in Andalusia, in Viscaya, and in Aragon our forces have given, and are still giving at the present time, proof of the utmost courage and strength? Workers of the CNT and the UGT! Remember the road we have travelled together. How many have fallen, covered in blood, in the open streets and on the barricades! Put down your weapons! Embrace as brothers! We shall be victorious if we are united. If we fight amongst ourselves, we must go down to defeat. Consider! We extend our hand without weapons. You do the same and everything will be forgotten. "Unity among ourselves! Death to fascism!" "The CNT and the FAI, who helped decisively in the defeat of fascism in Barcelona and Catalonia alongside the other anti fascist organisations, appeal to you to-day, to all of you, to put down your arms. Think of our great goal, common to all the workers, in the rear and at the front. "The government of the Generality must be cleaned out. These demoralising acts will have to cease regardless of who is performing them, including the ministers. "Workers of the CNT! Workers of the UGT! Don't be deceived by these manoeuvres. Above all else, Unity! Put down your arms. Only one slogan: We must work to beat fascism! Down with fascism!" Despite all these appeals and demonstrations of good-will to the police and the population of Barcelona, the hostilities, once started, were not to be held back. Indignation and bitterness increased on all sides. Four ministers of the CNT, who were in their respective offices when the hostilities broke out, could not reach the seat of the Generality - and no longer wanted to. The ministers of the other parties, especially the Premier, Tarradellas, and President Companys, declared that they could not carry on negotiations so long as the streets were not cleared of the armed forces, yet it was obvious to all that the continued presence of the armed forces in the streets was not due to the anarchists and syndicalists, but to the undisciplined police under the command of provocateur agents of the PSUC and the Estat Catala. The responsible organs of the CNT and the FAI had given ample proof of their desire to end the conflict by their manifestos to the people. The prolongation of the negotiations were, of necessity, fatal. The bitterness and the hatred grew by the hour. An explosion, a violent bloody fratricidal war might break out at any moment. The Catalan city police, and the members of the PSUC working with them, opened the hostilities in the centre of the city. At about 5 o'clock in the afternoon, an exceptionally cruel and bloody incident occurred on Via Durruti, not far from Casa CNT-FAI headquarters of the Regional Committees of the two organisations. Two cars were coming up the street from the direction of the docks to get to the Regional Committee. Some 300 metres from the Casa, a barricade of Catalan city guards and members of the PSUC, with red arm-bands was located. As the cars approached this barricade, they were ordered to stop and surrender their weapons. As they were getting out of the car to carry out the order, they were shot down by volleys of rifle fire. This incident, witnessed by many from the windows of the Casa CNT-FAI, aroused fierce indignation. The defenders of the Casa wanted to avenge the cowardly murder immediately. But after discussion decided to allow even this provocation to go unanswered, so as to avoid still greater harm. As it became apparent that the police not only did not intend to stop the hostilities, but were actually preparing to attack the headquarters of the Regional Committee itself, the Defence Committee decided to order two armoured cars from the arms factories for the defence of the Casa and its inmates. They arrived during the evening, and for the duration of hostilities, were held ready for defence. In the meantime, a sort of united front had been established between the Catalan Left (Esquerra), the Catalan Nationalists (Estat Catala), and the PSUC and UGT. They all defended the Minister of the Interior, Aiguade, and the Chief of Police, Rodriguez Salas, the two most directly responsible for the outbreak. This united front among the Ministers was carried into the street. Police, national Guards, Catalan city police, and members of the PSUC (affiliated to the 3rd International) and the UGT manned the barricades together against the workers of the CNT and the FAI, with whom the POUM, the Party of Marxist Unity, were also allied. This united front of all the left bourgeois parties with the communists against the syndicalist CNT and the anarchist FAI was ample proof that they were trying to create a situation in which they could remove the syndicalists and the anarchists from the government and discredit them among the workers. Although all the leaders of these parties may not have participated in the preparation of the conflict, it was, nevertheless, undeniable that all of them did not want to take advantage of it to remove, or at least weaken, the influence of that part of the Catalan proletariat that considers the struggle against fascism a simultaneous struggle against capitalism and for socialism. What had been carried out some months ago against the smaller party of the POUM with comparatively little effort was to be continued now against the mass organisations of the Catalan proletariat by the use of force. That the police under Rodriguez Salas had rebelled against the government was never stated in the official reports of the government. The population had to be told that the workers of the CNT and the FAI had initiated the conflict. Not only the Regional Committee of the CNT and FAI, and the assemblies of their delegates; not only the representatives of the various districts of the city, who were at the head of their barricades, favoured a peaceful solution of the conflict. The National Committee of CNT and its representatives in Valencia also demanded it. Shortly after 5 o'clock in the afternoon a delegation arrived from Valencia. consisting of the secretary of the National Committee of the CNT, Mariano Vasquez, and the Minister of Justice, Garcia Oliver, a well known anarchist. Members of the Executive Committee of the UGT also came from Valencia. Federica Montseny, Minister of Public Health, also came to Barcelona. At a joint conference, it was decided in accord with a proposal from the CNT to issue an appeal to the people to stop the hostilities and lay down their arms. This plan was discussed for two hours, the PSUC delegates displaying the greatest opposition. Sancajo, representing the Executive Committee of the UGT, Mariano Vasquez, as secretary of the CNT, Garcia Oliver, the anarchist Minister, and President Companys, all spoke over the radio calling upon the people of Barcelona to stop the fighting. "We must stop what is happening immediately. We must stop immediately so that our comrades at the front may see that we fully understand the present situation, so that they can face the enemy secure in the knowledge that they do not have to watch the rear because we cannot reach an agreement. Let us keep the present situation in mind! We must not suffer for another moment that feeling of collapse in the rear, which can only give comfort to fascism. Stop the shooting, comrades! But let no one try to conquer new positions when the firing has stopped. "We shall continue our discussions here until we have found a solution. The demands of self-preservation drive us to the unity of all the anti-fascist organisations of Catalonia. We are all assembled here, especially the Executive Committee of the UGT and the National Committee of the CNT who have come from Valencia to end this terrible conflict in Barcelona. We have come together to seek a joint agreement because this fighting can only serve the purposes of our enemy - fascism!" The negotiations in the Palace of the Generality continued during the entire night. Although the members of the syndicalist trade unions and of the Anarchist Federation of Iberia obeyed the appeal to stop hostilities, the rebel police, and even worse the members of other hostile parties, continued their criminal activities. During that very night the CNT Union of Hide and Leather workers were attacked in their headquarters. During the entire night intense rifle fire could be heard in the centre of the city. The night-long negotiations resulted in the resignation of the entire government. A provisional government was formed of one representative from each party that was represented in the former government. But calm was not restored. Upon the return of the representatives of the CNT-FAI from the Generality, the various committees of the CNT-FAI held a meeting. The two officials involved (Aiguade and Salas) whose dismissal was demanded by the workers, resigned with the rest of the Council of the Generality, and steps were taken to assure their continued absence from such responsible posts. When reports came in from Coll Blanch that further clashes were feared, the Committee of the CNT and the FAI took steps to call upon the workers to desist from their efforts to occupy the barracks. Again the workers did everything possible to avoid conflict. At 9.30 in the morning the assault guards offered a new provocation. They attacked the headquarters of the Medical Union at Santa Ana Square in the centre of the city. At the same time they attacked, with greater fury the headquarters of the Local Federation of the Libertarian Youth. The youth defended themselves heroically. Six young anarchists were killed in the defence of their premises. Both places telephoned the Regional Committee for help. The rifle fire, explosions of hand grenades and machine gun fire could be clearly heard throughout the centre of the city. The streets in the fighting zone were deserted, no one dared to go out. When, in the afternoon, the hostilities still continued the Defence Committee decided to call for three more armoured cars to defend the threatened Union headquarters. They came within a few hours to the Casa CNT-FAI, and were put into action to aid and support endangered unions and comrades. Soon after their arrival the tanks had a chance to go into action. Opposite the Regional Committee, three unarmed workers were being shot at in the street. The shooting came from the barricades of the PSUC mentioned before. The unarmed workers were seeking refuge in a doorway. They seemed lost. One of the armoured cars went to the rescue of the endangered comrades upon the initiative of a woman comrade. Hostilities to cease. Every party to keep its positions. The police and civilians fighting on their side be specifically asked to stop fighting. The responsible committees to be informed at once if the pact is broken anywhere. Solitary shots should not be answered. The defenders of the Union quarters to remain passive and await further instructions. During the fighting between the Catalan city guards and the assault guards against the Libertarian Youth, an assault guard was taken prisoner, but set free soon after to have his slight wound treated professionally. The proposals for armistice were accepted by the government, but the armed forces supposedly acting in defence of said government, paid no attention to it. During the afternoon they tried to encircle the headquarters of the Regional Committee, the Casa CNT-FAl. The rebels built new barricades, closer to the Regional Committee. The shooting never stopped. Rumours of the events in Barcelona reached the front. The well-known anarchist, Jover, rushed from Huesca to Barcelona. The militia at the front were concerned over the fate of Barcelona, they did not want it to fall into the hands of these counter-revolutionaries in disguise. It had l become obvious that the Catalan city guards and the assault guards who were both being manipulated by agent provocateurs and part of the petty bourgeoisie, seemed to be on the side of the anti-fascist coalition government. Actually they were pursuing different aims. All these elements were by now uncontrolled by the government. They had become a horde of counter-revolutionists set loose against the proletariat, and, specifically, against its organisations, the CNT and the FAI. In the face of the growing danger for the workers, for their union headquarters, their cultural centres and, above all, for the lives of all the militants, it was decided to organise a stronger defence. A Regional Defence Committee was created. Their deliberations in the Regional Committee were punctuated by continuous machine gun fire. Thus, the defence of the Casa CNT-FAI was organised. Reports came in from all parts of Barcelona and from the provinces of Catalonia that the overwhelming majority of the population were with the CNT, and that most towns and villages were in the hands of our organisations. It would have been easy to attack the centre of the city had the responsible committees so decided. They only had to appeal to the defence committees of the outlying districts. But the Regional Committee of the CNT was opposed to it. Every proposal of attack was unanimously rejected by them and by the FAI. A newly founded group, called 'Friends of Durruti' functioning on the fringes of the CNT-FAI, published a proclamation declaring that, "A revolutionary Junta has been constituted in Barcelona. All those responsible for the putsch, manoeuvring under the protection of the government, shall be executed. The POUM shall be a member of the Revolutionary Junta because they stood by the workers." The Regional Committees decided not to concur with this proclamation. The Libertarian Youth likewise rejected it. On the next day, Thursday May 6th, their official statement was printed in the entire press of Barcelona. This article caused Russia to intervene in the CNT-FAI. Since then, Berneri was anathema to the partisans of the Communist Party Dictatorship. When the hostilities started, Berneri was in his- rooms with his friend, Barbieri, also a well known anarchist. With them were the wife of Barbieri and Tosca Pantini, widow of an Italian militiaman killed on the Aragon front. The Italians' house was surrounded by Catalan city guards and members of the PSUC wearing red armbands with their party insignia on them. On the morning of Tuesday May 4th, the Catalan and Communist guards came to the house and told the Italian anarchists to be careful because there was a lot of shooting in the neighbourhood. There was another visit in the afternoon for the purpose of registering the house and confiscating the arms which belonged to Italian militiamen on leave in Barcelona. The next day, Wednesday May 5th, at about 5 o'clock in the afternoon, Berneri and Barbieri were taken away by 12 guards, six of them from the city police, the others were members of the PSUC as evidenced by their red armbands. The leader of the group, showing his badge with the number 1109, asked for their names. Two of the group remained in the house to carry out a further search. Berneri had been working on a book about Mussolini's policy in the Mediterranean, with special reference to the Balearic Islands. It was a book against Italian fascism. Barbieri's wife wanted to go with the two comrades when they were taken away, but they refused to allow her. Both men were shot during the following night, by machine gun fire, as revealed by the autopsy. It was cold blooded murder, since both men were unarmed. The murder was committed near the Palace of the Generality. Soon after the bodies of the two anarchists were delivered to the mortuary of the Hospital Clinico. The lists show that the Red Cross had found both bodies near the Generality. The anarchists were persecuted; the anarchists were murdered; the anarchists were outlawed. Still they limited themselves only to defence, and never attacked. Yet when the lie was circulated that the anarchists were doing the attacking, the world press seized upon it eagerly and spread it to the four corners of the earth. On the following day the papers published the number of victims: 500 dead and over 1500 wounded. A terrible indictment of those who had provoked such a fratricidal war. "The tragic events taking place in our city during the last 48 hours have made it impossible for the workers to go to work. The anti-fascist organisations and parties in session at the Palace of the Generality have solved the conflict that has created this abnormal situation, so harmful to the cause of the proletariat. The local federations of the CNT and the UGT have agreed to ask all members to resume their work as usual. It is necessary to return to normal life. To continue the present inactivity in the factories at this time is to weaken our forces and strengthen that of our common enemy. "Accordingly, all workers of the CNT and the UGT are ordered to return to work. All members of both trade unions should avoid anything that might lead to possible friction and disturbances at their place of work. These events have taught us that from now on we shall have to establish relations of cordiality and comradeship, the lack of which we have all regretted deeply during the last few days. "The local federations of the UGT and the CNT urge their members to refrain from all manifestations of hostility. Mutual understanding and solidarity are the requirements of the hour. The union cards of both organisations must be respected by everyone, and it is the duty of the control committees to respect all workers without exception. "To work, comrades of the CNT and UGT!" Local Federation of the CNT, Barcelona. Local Federation of the UGT, Barcelona. This appeal was broadcast over the radio and appeared the next morning in every paper in Barcelona. But to no avail. Work was not resumed anywhere. The police continued in their hostile attitude and fortified their positions further during the night with the obvious intention of extending the struggle. Provocation's by the political parties continued in the hope of shaking the faith of the workers in the conduct of the committees of the CNT and the FAI. The fighting was resumed. Bitterness and discontent filled the workers. The Valencia government intervened more energetically into the affairs of Barcelona. Two Spanish warships were ordered to the port of Barcelona. The streets presented a calmer picture on Thursday morning. The centre of the old city was still like a fortress. Some horse carts were already making their appearance on the wider streets, and an occasional pedestrian could be seen. The overhead wires of the tramways were being repaired. The Valencia government, it was rumoured, was gathering troops from different sectors of the front to be sent to Catalonia. The Regional Committee and the syndicates all over the city suffered new anxieties when the police and the civilian fighters of PSUC proceeded to take advantage of the armistice to build new fortifications. Thus, the police openly carried sand bags and machine guns up to the towers of a cathedral not two hundred metres from the Casa CNT-FAI. This hardly looked like peace. Those who seek peace don't proceed to occupy new offensive positions. Further news added to the anxiety. 1,500 troops are on their way from Valencia. Another 2,500 will follow. Against whom are they mobilising? Against the workers? In the streets of Barcelona everybody was being searched. Those who had membership carnets from the CNT were regarded as enemies. The carnet was taken away and torn up. Often, mere possession of such a document was cause for arrest. Dozens of such arrests were being made. The negotiations between the antagonistic parties were delayed half a day by the death of the secretary of the UGT of Catalonia, Antonio Sese. He was fatally wounded by a bullet on his way to the Generality in his own car. 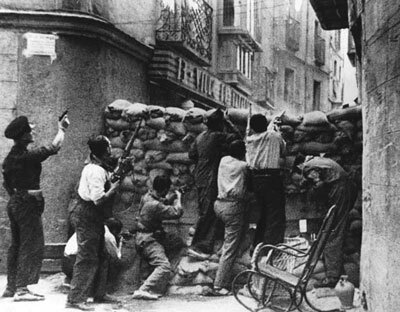 The shot came from the direction of the Paseo de Gracia, where his own party comrades had a barricade. The comrades who accompanied Sese signed a document stating the facts of the case, which is now in the hands of the Theatre Union in front of whose headquarters the accident occurred. Sese was neither murdered nor executed. Yet his death was used to intensify the insidious campaign against the CNT. A strange situation had developed inside the Telephone Building. The workers in the upper storeys and the assault guards arranged an armistice. They allowed the workers to receive food - the first since, Monday. The discussions among the workers who belonged both to the CNT and the UGT, still continued. To end these discussions and to show their willingness to restore peace, .he members of the CNT agreed to leave the building at 3 o'clock in the afternoon. The assault guards were supposed to leave also. However, instead of leaving that part of the building which they had occupied earlier in the week, the assault guards proceeded to occupy the entire building, and brought in members of the UGT to take over the posts of CNT workers. The members of the CNT saw that they had been betrayed and immediately informed the Regional Committee. The latter intervened with the Government. They demanded that the police be withdrawn from the building. To remain meant a broken promise would render their agreements valueless for the future. Those who broke their agreement would have to take the consequences. Half an hour later the Generality replied: the fait accompli cannot be recalled. This broken agreement aroused great indignation among the workers of the CNT. Had the workers in the outlying districts been informed immediately of this development, they would surely have insisted upon taking firmer measures and returned to the attack. But when the matter was discussed later, the more moderate point of view won out. It was obvious that the occupation of the Telephone Building would be used to facilitate new attacks. And within the hour, at about 4pm, a new attack was launched against the main railroad station, Estacion de Francia. The assault guards attacked from one side; the PSUC from the Karl Marx Barracks on the other. The workers could no longer depend on the telephone. The atmosphere in the centre of the city became tense. Bombs exploded. Rifle and machine gun fire broke the silence of the metropolis. At ten minutes past four, the Under Secretary of State, Juanel Molina, member of the FAI, communicated that General Pozas had presented himself at the Capitania to take over his office as Chief of the Fourth Brigade of the Spanish Army. The post of Catalan Minister of Defence had ceased to exist. Under Secretary of State Juanel Molina, even though he was a member of the FAI, did everything to keep the troops from entering the struggle. Had the FAI really gone into action, the entire military force would have been on their side and victory would have been certain. But the FAI did not want a fratricidal war within the ranks of the anti-fascists. Not only at the station, but also in the neighbourhood of Plaza de Catalunya, the police started attacking the workers. In both cases the attacks were successfully repelled. Again the workers refused to counter-attack. Still, they were determined to defend their positions, their lives and their rights. The Regional Committee was informed that the armed forces of the Catalan Nationalists and the PSUC had taken possession of the village of San Juan. The armed workers of the CNT and the FAI entered the village, disarmed the enemy and liberated their comrades. In the open village square they had to answer for their actions. They were warned not to take up arms against the people. Then the anarchists set their enemies free again. We must mention these incidents to counteract the calumnies spread against the anarchists and the anarcho-syndicalists of Catalonia, whom they characterise as murderers and criminals. At six o'clock they telephoned that 1,500 Assault Guards had reached Tortosa on their way to Barcelona. They occupied the headquarters of the CNT unions, the cultural centres of the FAI and the Anarchist Youth, arresting all those found inside. These troops had come from the central part of Spain. According to the evening paper Noticiero Universal of Saturday May 8th, these troops had come from the trenches of the Jarama front, where they had been fighting for four months alongside the International Brigade. The anarchists could also have called in their columns from the Aragon front, as well as armed forces from other parts of Catalonia, and there is no doubt that they could have been victorious within 24 hours. But they did not want to break up the anti-fascist front. They never did more than defend themselves against the attacks directed against them. "While the tragic events were taking place here in Barcelona, provoked as they were by some irresponsible elements in the anti-fascist organisations, the world at large received very little information concerning the whole situation. "The same cowardly elements that wished to provoke bloodshed in Barcelona, issued false reports to the outside world with the same evil intentions, grossly misrepresenting everything. "Foreign countries have been told that the CNT and the FAI were the cause of the disturbances of the last few days. You were told that the anarchists were guilty of starting this struggle among fellow workers which caused blood to flow in the streets of Barcelona. You were told that the anarchists attacked the police the Generality, and other municipal and state institutions. "Nothing is more false than this version of the developments and those who spread such lies intentionally can be nothing but fascists in disguise. "Now that we have returned to normal, and those responsible for the outbreak have been dismissed from public office, when all the workers have returned to their jobs, and Barcelona is once more calm, the CNT and the FAI want to give an exact explanation of what happened. "We are authorised to state that neither the National Confederation of Labour, nor the Iberian Anarchist Federation, or any of its dependent organisations, broke, or had any intention of breaking the anti-fascist front. The CNT and the FAI continue to collaborate loyally as in the past, with all political and trade union sectors of the anti-fascist front. The best proof of this is that the CNT continues to collaborate with the central Government, the Government of the Generality and all the municipalities. "When the conflict started in Barcelona, the Regional and National organisations of the CNT offered every means to the government to help solve the conflict as quickly as possible. On the second day of the struggle, the secretary of the National Committee of the CNT, and the Minister of Justice, also a member of the CNT, came to Barcelona and did everything humanly possible to end this fratricidal struggle. In addition to these attempts to deal with responsible members of the other political sectors, these comrades spoke to the population of Barcelona, and called upon them to be calm and work for an agreement, and appealed for unity of action against the common enemy, fascism. "Not only the National Committee, but also the Regional Committee, did everything possible to find a solution to this conflict. The press of the CNT of Catalonia appealed for calm and called upon the population to return to work. The news issued by radio to the unions and to the defence committees were nothing but appeals for calm. "Further proof that the CNT did not want to break, and did not break, the anti-fascist front, is that when the new government of the Generality was formed, on the 5th of May, the representatives of the CNT of Catalonia offered it every facility, and the secretary of the CNT was a member of the Government. "We are also authorised to state that neither the National Confederation of Labour nor the Iberian Anarchist Federation attacked any police headquarters or any other institutions of the State or the Generality. At no time and at no place did the first shot ever come from any responsible members of the CNT. "The members of the CNT who controlled the Defence Council of the Generality gave orders to all their forces not to intervene on either side in the conflict. And they also saw to it that their orders were obeyed. "The Defence Committee of the CNT also gave orders to every district of Barcelona that no one should come from there to the centre to answer the provocation's. These orders, too, were carried out because no one actually did come to the centre to answer the provocation's. "The Regional Committee of the CNT and the FAI gave precise orders that no one should move from his section, that no one should disturb the public order. "The CNT and the FAI not only merely maintained positions of defence, they did everything possible to try to re-establish public order and unmask the provocateurs. Many were the traps laid for the CNT up to the very end, but the CNT remained firm in its position and did not allow itself to be provoked. It did not fall into the net, which had many ramifications in the regional, national and international spheres. And in maintaining its positions, it did everything possible to have the provocateurs, Rodriguez Salas and Aiguade, removed from their responsible positions. Once this was accomplished, and calm re-established, the CNT and the UGT together with the other anti-fascist forces, formed a commission to clarify the events in Barcelona and re-establish a normal atmosphere. "When the causes of the disturbances were discovered, the people returned to work. Everybody, with utmost courage and energy, is now dedicating all their strength to the fight against fascism, because it is the only enemy of all the workers in Catalonia. Meanwhile sporadic collisions and exchanges of shots continued in various sectors of the city. At about 10pm the CNT-FAI made new proposals to cease hostilities as follows: All parties and groups obligated to remove their armed guards and Patrols from the barricades. All prisoners from both sides are to be released immediately. No reprisals shall be taken. An answer was required within two hours. At midnight the government had not sent its answer. Meanwhile disturbing news came through from Tarragona and Reus, where members of the PSUC and the Estat Catala, taking advantage of the presence of some assault guards passing through on their way to Barcelona, used their temporary advantage to disarm and kill the workers. Telephone calls caused great anxiety. Steps were taken to counteract the news and any possible false rumours that might be coming through the telephone exchange. Important news could no longer be communicated by telephone. The radio station of the CNT was used to inform members of the organisation. The CNT tried to extract a promise from the government in Valencia and Barcelona that the assault guards would not enter the city immediately, but should be held outside the city limits until the situation had cleared up. The arrival of the troops while the people were still so tense, would undoubtedly mean a renewal of hostilities and further loss of lives. The CNT and the FAI wanted to avoid this. They were somewhat sceptical regarding the assurances that the troops would be loyal to the workers. The night of May 6-7th was decisive for the immediate future. The CNT and the FAI had not yet exerted the full pressure of their strength. They still continued in a waiting position. Should they summon all of Catalonia to take up the fight against the nationalists and the provocateur elements among the police and some of their chiefs? They could have rallied a tremendous force but they did not want to continue this fratricidal conflict. Again and again the anarchists offered to negotiate, eager to end the conflict. But the atmosphere was tense and the situation continued to be difficult. Fighting was going on in Tortosa and in Tarragona. At twenty past one, new telephone calls to the representatives of the government. No satisfactory answer to their proposals. The assault guards were continuing their march on Barcelona. In the centre of the city, the Catalan Nationalists and the rebellious police kept coming closer and closer to the headquarters of the Regional Committee. In San Pedro street in the immediate vicinity of the building, a new barricade was erected by the police. They were trying to encircle the Regional Committee of the CNT and the FAI. At two in the morning the government had still failed to answer the proposals, awaited with so much impatience and anxiety... Twenty minutes past two. No answer... Half past two. No answer... A quarter to three... Three o'clock. Still no answer. They were discussing the resumption of work in the outlying districts where the fighting had stopped. The traffic could not start unless the barricades were pulled down. The delegates of the transport workers union were awaiting the answer of the government in order to give the order to start work again... A quarter to four and still no answer... At five minutes to four in the morning, the Provincial Committee communicated that they were ready to hold up the troops from Valencia... Four o'clock. No answer. At last, at a quarter past five, the government answered. They agreed to the armistice. All parties shall leave the barricades. Patrols and guards retire to their headquarters, unions and fortified positions. Both sides to release their prisoners. The patrols to resume their functions. Everybody relaxed. But - could one trust the sincerity of this answer? Would the workers in the telephone exchange continue to function as before? Would everything come out all right again? "To all the workers of the CNT: Having reached an understanding with both the political and the trade union representatives, we wish to notify you that you will receive instructions from your responsible committees regarding the establishment of complete peace and calm. For the present we urge you to keep that calm and presence of mind that the situation requires. Do not answer the provocation's of those who seek to perpetuate the existing state of disorder." While the results were still being discussed, new fears arose as the shooting broke out again to disturb the enveloping silence of the night. Two cars were driving down Via Durruti. As they passed the police prefecture, they were shot at. They were able to pass the headquarters of the Regional Committee undisturbed but a short distance away the shooting broke out in full force once more. Rifles, machine guns, hand grenades came into play. A bad sign. A strange contrast to the assurances of a peaceful solution of the conflict. Only half an hour to 6 o'clock. Will we be able to pacify the suspicions and the tempers of the comrades? At six o'clock, shots could still be heard. We switched off the lights. A beautiful morning. Barcelona slept in silence. A few hours later, Barcelona had undergone an almost complete change. True to their agreement, the workers had left the barricades. In many places the barricades had already been torn down. They had withdrawn from the buildings. But they were keeping their arms. In the centre of the city, however, the air was still tense. The barricades of the assault guards, of the Catalan Nationalists, and of the PSUC remained intact. And guarded. Taking advantage of the good will of the workers, groups of assault guards were walking about disarming workers wherever they could get hold of them. New friction arose between the assault guards and the Libertarian Youth in the Plaza del Pino and the Puertafer. And once more it was thanks to the initiative of the Anarchist Youth. who went unarmed to the headquarters of the assault guards to negotiate, that finally, after hours of discussion. the assault guards decided to show a more peaceful attitude and the barricades could come down. The centre of the city was like a fortress. High buildings had been used as fortifications by the various groups. Out of walls of sand bags, mattresses or cushions. rifles and machine guns poked their barrels. The assault guards had opened the churches and used them as fortifications. But the populace could breathe more freely. For three days they had been forced to remain in their houses. Now everybody was walking about in the streets. The masses of people pushed their way through the barricades. Children played at revolution, rolling up a rock in a piece of paper and throwing it at the counter-revolutionists from behind the barricades. Everybody was discussing the situation in the bars and cafes. Around midday another incident occurred. In the Calle Boqueria, a car of the Libertarian Youth was stopped by an assault guard, the youth disarmed and arrested. This was an obvious breaking of the agreement that there should be no more arrests and no more reprisals. In the calle San Pedro, CNT people were also threatened by the assault guards. Towards evening further incidents occurred. Near the Arco de Triumfo and in the Puerta del Angel shots were fired, not by the workers of the CNT but by the rebellious police. The car of Federica Montseny, Minister of Public Health, was also shot at, one of the passengers being wounded. At twenty past eight the assault guards from Valencia reached Barcelona. They drove down the Via Durruti in motor trucks, and were welcomed at the Police Prefecture. What will their attitude be towards the workers? And what attitude will the workers take? As they passed the headquarters of the Regional Committee, a shot was fired from one car, while from another came the cry, 'Viva la FAI". Obviously their feelings and attitude toward the workers, toward the syndicalists and anarchists of Catalonia, were as mixed as their composition. The workers had put down their arms and they did not think of taking them up again. The conflict was over. The workers were true to their agreement. But the other side did not prove as honourable in upholding their part of the bargain. However, everything remained quiet. No matter how much they tried to provoke the workers of the CNT and the FAI, the latter kept their presence of mind and their dignity. The workers of the CNT and the FAI had not started this conflict, nor did they want any part in prolonging it. They had not been conquered, even though the Catalan police assumed a provocatively boastful attitude after the Valencia troops arrived. Again and again they tried to put the workers in the position of the defeated party. Yet their own conduct had been strange. The Catalan nationalists, always strongly opposed to the influence of Madrid and fighting strenuously for autonomy, had appealed for help to the Valencia Government to defend their privileges. They played the same role now as the Catalan Right parties had played a few years before. In October 1934, Cambo and his League insisted on the intervention of Madrid; at that time the Catalan Left had opposed them. Now, since the Catalan Right had been defeated on July 19th together with the fascist Generals, the Catalan Left demands the intervention of the central government in Catalan affairs. In both cases, the interests and privileges of property, of capitalism, were being defended. In both cases they fought against the workers who were striving for the Social Revolution. The orchestra leader had been changed, but the music was the same. What happened in the provinces of Catalonia proves that the entire movement was organised to destroy the CNT and the FAI and, with them, the revolutionary achievements of the 19th of July. The various towns and villages of Catalonia reported to the Regional Committee on what happened. These reports show the counter-revolutionary character of the movement. At Montesquieu, Lafarga, and Bisaura the members of the CNT were persecuted and even driven away. Sixty anarchist refugees from the neighbouring villages came to Vich. "Our Collective, consisting of 450 members has been a model for the entire district. For seven months we have made economic sacrifices in order to build up our Collective. We have done away with the wage system, have established a just distribution. We had a co-operative barber shop, co-operative kitchens and a big coffee house. The capital invested by the workers, and the stock on hand was worth 45,000 pesetas. All this has been taken away from us, so that our families are now starving. Our barber shop had ten modern chairs. These, as well as our stock of textiles and our collective stable of work horses have been taken away from us. They even went so far as to invade the homes of our comrades and rob them of clothing and money. Forty comrades have been arrested and were taken to Tortosa. Sixty civil guards remained in the village after they had finished their thefts. They are still occupying everything. We beg the comrades to send us help soon because we fear they will take everything away from us, even our supply of oil, worth 140,000 pesetas." At Amettla de Mar not only were workers molested, but also the militiamen who had membership carnets of the CNT. The secretary of the CNT unions was arrested, and his position as a rnember of the Municipal Council taken over by a member of the PSUC and UGT. At Tortosa the repression was even worse. CNT membership carnets were taken away from their owners and torn up. The assault guards worked together with the members of the PSUC. Syndicalist and anarchist members of the Municipality were expelled and substituted by members of the small bourgeoisie and the PSUC. Numerous arrests were made. At Villadalan Juan Garcia, the anarchist member of the City Council was arrested and all the anarchist members of the City Council were expelled from office. The membership carnets and banners of the CNT were torn up. The inhabitants of Amposta were compelled to surrender their arms to the assault guards. This action was in no way justified. The people were going about their daily occupations. The production of rice in this village since July 1 9th , amounted to 4(),000.000 kilos and the community had put this at the disposal of the Republic. There were no differences between the CNT and the UGT here. Both organisations sent a delegate to Barcelona to request the Government to remove the troops. When the delegation reached Tortosa, the CNT representative was arrested. A new delegation was sent to Tortosa to secure the release of the arrested comrade. Without success. Later Amposta was occupied by civil guards. The workers gave up their arms, and shortly afterward, the civil guards distributed these arms among the Socialist Youth (members of the PSUC youth organisation). Arrests were made; and ten days after, five of the arrested were still in prison in Tortosa. On May 5th, at eight o'clock in the morning, the telephone exchange was occupied by a heavily armed police force. The telephone calls were censored and the telephone connections between the different sections of the CNT and the FAI cut. At midday Comrade Casanovas, representative of the telephone workers and employees, went to the military headquarters to inform the chief of the coastal service of the occupation of the telephone exchange. They agreed, after discussions with the Chief of Police, that the police should retire from the upper floors of the building where the technical apparatus is, and remain in the hall below on guard. Later, the Chief of Police communicated that the Delegate of Public Order refused to observe the agreement, presumably following orders from Barcelona. Shortly afterwards a number of people were seen entering the headquarters of the left republican parties unarmed, and leaving equipped with rifles. The same thing was going on at the headquarters of the Socialist Youth: Casa del Pueblo. The comrades of the anarchist and anarcho-syndicalist organisations also began to gather in their centres and prepare for their defence. Heavy fire broke out again at half past three in front of the headquarters of the Libertarian Youth, which was now being attacked by both police and civilian forces. A new commission of the CNT-FAI demanded that the Generality call a meeting of all the anti fascist organisations. The Chief of Aviation at Reus had taken over public security. The CNT and the FAI informed him that they did not want to shed any blood and therefore wanted a conference of all anti fascist organisations. At last the Conference took place. The Chief of Aviation declared that he had orders to proceed against the CNT-FAI by force if they did not immediately surrender all their arms. 1. Release of all the imprisoned. 2. Withdrawal of the armed police and all other armed formations. Members of the Air Force were to take their place. 3. The life and liberty of all comrades, as well as their homes, to be respected. The comrades of the CNT-FAI turned over all their arms to Captain Barbete himself in the headquarters of the Transport Union. The captain noticed and remarked on the fact that the weapons had not been used at all. He congratulated the comrades of the CNT on their sensible conduct. Arms were also given up to the police at the CNT headquarters. And still there was no calm. About three o'clock in the morning, assault guards and police attacked the headquarters of the Ministry of Defence. The persecutions against the militants and comrades of the CNT-FAI first began then. Thus, once more, the authorities and political organisations broke their promises. Following are the names of comrades who were found murdered in various places outside the city: Mario Berruti, Baltasar Ballejo Mateo Freixas, Jose Gallisa, and Julian Martinez from Figueras. The last three had been arrested and taken to the police station. From there, assault guards took them to an unknown destination. Two hours later their corpses were identified in the morgue of the cemetery. Four other bodies could not be identified, but we must assume that they were also comrades of the CNT and the FAI. Many houses of our comrades have been searched. These searches were carried out by the police and members of the Communist and Catalan Nationalist Parties. On May 7th, at a quarter past nine in the morning the merchant, Gisbert, appeared at the quarters of the co-operative stores of the CNT accompanied by the merchants, Jose Luis and Juan Galvet, and the railwaymen, Roche and Llacer, and obliged the personnel at gunpoint to stop working. The personnel and clients were compelled to leave the shop while the intruders remained behind as victors. A truckload of goods was stolen. After the airborne troops had retired, assault guards and members of the Communist and Catalan Nationalist Parties invaded the headquarters of the CNT. They forced the doors open and destroyed the furniture. Thefts were committed in all the CNT local branches. One Recasens, member of the Esquerra, tried to assassinate a wounded comrade, Balabasque, member of the Libertarian Youth, in the City Hospital. The murder was prevented by members of the hospital. But when the brute threatened to kill Balabasque after he had recovered, the wounded man died from the shock of the entire incident within two hours. It is obvious, from the narrative of these days, that the anarchists and syndicalists did not initiate a putsch. The workers were not interested in any internal struggle among the anti fascist parties. On the contrary, it was in their interest to maintain the anti fascist front. It is also false to speak of uncontrolled elements having started the fighting, and, by that, mean the anarchists and syndicalists. The Paris evening paper, Ce Soir, makes this mistake out of sheer ignorance. In its edition of May 6th, it says: "The Generality is master of the situation. Some of the suburbs still seem to be in the hands of the enemy. Who are these enemies? It seems that the rebellion was started by some uncontrollable elements who managed to get into the most extreme wing of the anarchist movement in order to provoke disturbances in favour of the enemies of the republic." The Spanish press also spoke of uncontrolled elements, and referred to the anarchists. Every conceivable crime and excess was attributed to them, thereby covering the activities of the members of the PSUC and the Estat Catala, who were committing the most horrible atrocities. Here is an example of an incident in which truly uncontrolled elements indulged: During the tragic days, twelve militants of the anarchist youth were going from the suburb Armonia del Palomar to the offices of the Regional Committee. Near the city park they were stopped and taken to the Karl Marx Barracks, belonging to the PSUC. They simply disappeared. This took place on May 4th. Four days later, on May 9th, a mysterious ambulance left twelve terribly mutilated bodies on the road between Bella Terra and Sardanola Ripolet. The corpses were identified as those of the twelve young anarchists from Armonia del Palomar. These are the names of some of them. Cesar, Fernandez Nari, Jose Villena, Juan Antonio y Luis Carnera. La Noche continues: "Since we know about said incident we wish to correct the mistake. On Wednesday morning, a well-known printer, with premises in the Calle Nueva de la Rambla, came to the Red Cross station on Calle Casanova. He asked for an ambulance to go to the rescue of his child who had been bitten by a mad dog. Owing to the tragic situation, the Red Cross could not spare an ambulance. However the delegate of the transport workers union of the CNT offered to help the man. An ambulance took them to the headquarters of the CNT nearby, where some rather heavy shooting was going on. The Regional Committee of the CNT put a car at the disposal of the despairing father, who was thus able to get help for his child...There was no conflict and no wounded at the Casa CNT-FAI. Only an act of humanity on the part of the comrades of the CNT." Peace was restored among the warring brothers. The CNT, as usual, kept to the agreement which it had accepted. Their militants put down their arms. They went back to work and did everything to prove their willingness to re-establish peace. They left their strategic positions. They started to tear down their barricades. Nothing must remain as a reminder of this tragic fratricidal struggle. On Sunday night, May 9th, after two days of calm, some uncontrolled elements of the UGT took advantage of the deserted condition of the city at 10 p.m. to send a number of men from their metal workers union, located on the Calle Diputacion to the headquarters of the theatrical workers union of the CNT, opposite them. They had chosen an hour when they expected no resistance. Our comrades were there, but decided not to resist. They called up the Executive Committee of the UGT and asked them to call back their uncontrolled and undisciplined members from the offices of a CNT union. On Thursday, May 15th, the headquarters were still occupied. An even more vivid example: The Union of Liberal Professions of the CNT, art section, had opened an art exhibition in their headquarters. These were paintings saved by the anarchists during the early days of destruction. In the course of the fighting, some uncontrolled members of the PSUC broke into the exhibition hall with guns and revolvers drawn. The artists who were present did not want to start a bloody battle. The uncontrolled elements took possession of their quarters as well as of the exhibition. The pistoleros of the rebels reigned over the cultural centres of the anarchists. The anarchists, were they the men of blood and cruelty they are reported to be in Spain as well as abroad, would have proceeded to recapture the building. They rejected such a step. They did not want to risk the destruction of the art treasures they had rescued on the 19th of July. Their responsible Committees preferred to intervene with the official government to have their exhibition cleared of the intruders. According to the pact, the prisoners were supposed to be released immediately by both sides. The comrades of the CNT and the FAl remained true to their word. They were self-disciplined and immediately released hundreds of prisoners, most of whom had put themselves under the protection of the anarchists voluntarily. Their opponents were not so faithful to their promises. Long negotiations were required before the communists and the Catalan nationalists would release their anarchist prisoners. A full week after the re-establishment of normality, many members of the CNT and the FAl were still being held. On the 13th of May, the anarchists, Cosme Paules del Roro, lose Dominguez, Antonio Ignacil, Francisco Sarqueda are still imprisoned in the Karl Marx Barracks, while Miguel Castells, Jose DegÃ¡, Ãlvaro GalcerÃ¡n, José Luis GarcÃ­a, Manuel Horno, Jose Lucio GÃ³mez, Eulogio Marqués Romero and Antonio SÃ¡nchez are still being held in the offices of the Central Committee of the PSUC (Pedrera). In the headquarters of the Estat CatalÃ¡, in the Rambla Catalonia, Miguel Piqué IbÃ¡-ez, José Rovira and RamÃ³n Robello, all militants of the CNT and the FAI are still detained. 200 militants of the CNT-FAI are still prisoners in the police jail. Many have been arrested in the Palace of the Generality and are still being held: and others have disappeared, no one knowing whether they are being held by the PSUC or the Estat CatalÃ¡. Does anyone want to suggest how balanced this account is?